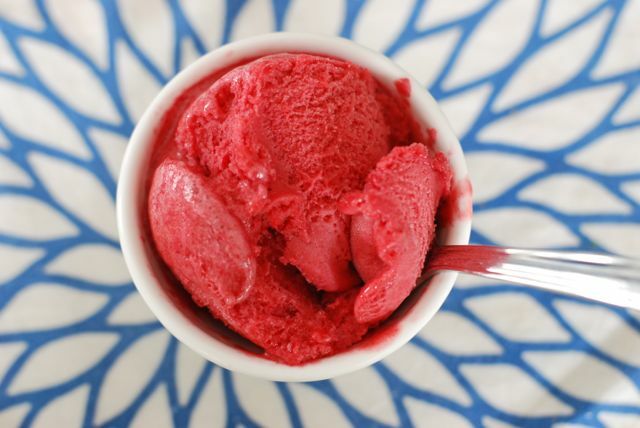 One of my favorite frozen treats in the summer is raspberry sorbet. It is fruity & refreshing, and can be made in just two steps. I make it right in my food processor and pop it in the freezer to chill, and it is ready in just a few hours. You can even eat it right out of the processor—I won’t tell. This recipe works well with other small berries like strawberries, blueberries, or a mix. Once you get used to making it you can also try adding more flavors like chopped herbs or dashes of flavored simple syrups! 1...2...done! The most delicious way to cool off on a long, hot summer day. Step 1: Place the ingredients in a food processor fitted with a blade, or a blender. Process thoroughly until it is a smooth liquid. Step 2: Pour the raspberry liquid into a 9x9 pan, or something a similar size. Chill it in the freezer for at least 4 hours, or until firm enough to be scoopable. Enjoy!